Cash is preferred, however, we will finance with 30% down and monthly payments over 18 months at 0% interest. Financed sales require the purchase of mortality insurance for the balance owed with Kinkora Farm named as the Loss Payee. 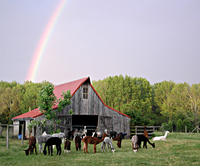 Purchases of 1 or more alpacas for a minimum of $10,000 can be financed for up to 4 years at prime + 2% interest rate payable monthly, depending upon the number of alpacas purchased and the total amount financed. We offer 3 months free board with the purchase of any breeding stock animal (fiber quality not applicable).